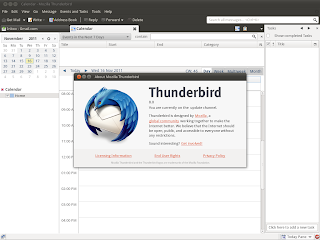 After some days of delay, Thunderbird 8 was finally published to its Stable PPA yesterday, but it hasn't arrived in Ubuntu Oneiric's official repositories yet. The most important new features include that its now based on the very same Gecko engine Firefox is based on, and that add-ons installed by third-party programs are now disabled by default. Thunderbird is based on the new Mozilla Gecko 8 engine. Add-ons installed by third-party programs are now disabled by default. New Search and Find Shortcuts. Improved accessibility of the attachment list. Folder switching pane widget has been removed, can be added back with the Folder Pane View Switcher Add-on. Numerous platform fixes to stability. Update 11/21/2011: As Thunderbird 8 packages still aren't released to the official repos, I've started to wonder if they ever will. So here is another way to do a proper installation via a repository, to first integrate it better into the system, and also get future updates automatically: Ubuntuzilla.